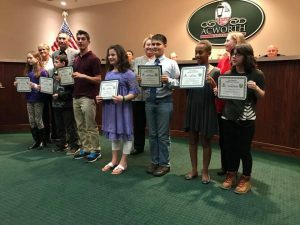 The City of Acworth along with the Acworth Tree Commission held a special celebration for all of the Arbor Day Poster Contest winners. Local schools participate in this poster contest each year based on the theme set by the Acworth Tree Commission. This year’s theme was “Tweets About Trees.” We had so many wonderful entries and the winners were recognized by Mayor Tommy Allegood and Board of Aldermen at the City Council Meeting. Congratulations to all of the poster winners, and we wish you the best of luck next year! Thank you for honoring our students, Acworth Tree Commission, City Council, and Parks & Rec!